we tried to stay off the big roads leading to istanbul as much as we could. it took a little longer but we felt much safer this way. just inside the city i got a flat tire and as we stopped johannes was passing by. he was working in bukarest for a few month and cycled from there to istanbul. we soon got off our bikes and continued by foot. as we were looking for a hostel we ran into a canadian couple who just came back from a bicycle trip from the southern turkey and had some useful information to share. we soon found a hostel with everything we wanted for 10 euros a night. 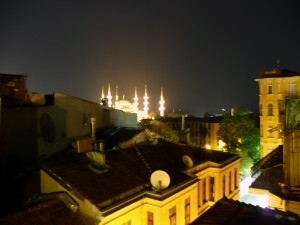 one great thing about this place is the roof terrace with a wonderful view over istanbul and the blue mosque. on the second night i played a concert in front of a lovely audience with this setting as background. a wonderful experience! the day we spent at the grand bazaar which was a little disappointing. i hope to see a place like i was hoping for when i travel through iran. i applied for a visa and can hopefully collect it on the way in erzerum. the following day we took the ferry to the asian side. it takes about 20 min. 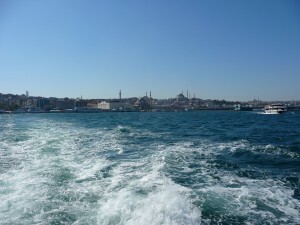 and offers a beautiful view over istanbul and the bosporus.